« Learning the lines: Sound advice from a fellow actor–and your wife! Robin Haha, lovely what a giant tomato, that’s gonna be a lot of stuffing must be about 600-700 gr ? ?Have a nice evening, hughs from Antwerp to both ! Hello Robin and Meredith: I know fall is just around the corner when you report on how much honey Meredeth was able to collect for the summer. The leaves on our phlox (tall flowers) were all mildewy this year after a bout of rain. (Prob’ly doesn’t help that they are in a partly shaded area!) What do you do to stop it? It didn’t kill the flowers–just made the leaves look yucky. 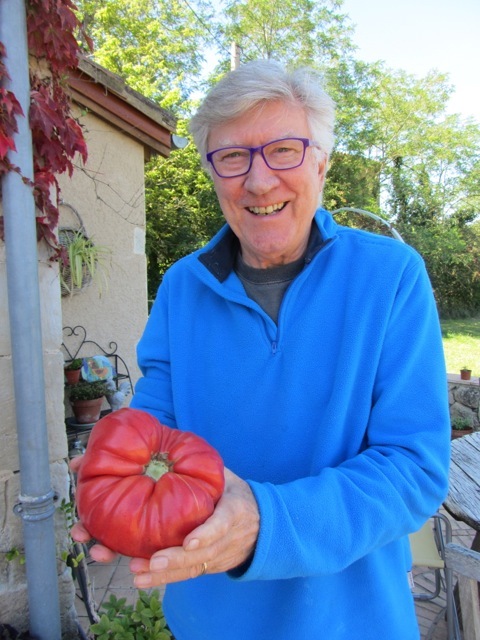 I’m guessing from what I’ve seen that this is a Brandywine, which can be a huuuuge tomato, often weighing 2-3 pounds, over 1.5kg. I would have had a hard time making sauce with it, as I prefer to slice it and turn it into a caprese salad or stacks thereof. If the source I found is correct, in the US we would call les peches de vines “Indian Blood” peaches. I swear they are the most intensely flavoured peaches I’ve ever had, and I’ve only been able to eat them twice. They come in cling and freestone, and yes, the season is incredibly short. These might have been the peaches that the Navajo prized so much before the Long Walk. In a series of marches starting in 1864, 9,500 Navajo and 500 Mescalero Apache were forced by the U.S. Army to walk 400 miles from their reservation in northeastern Arizona to the edge of the Pecos River in eastern New Mexico; like the forced march known as the Trail of Tears (the forced relocation of Native American nations from southeastern parts of the United States following the Indian Removal Act of 1830. The removal included many members of the following tribes, who did not wish to assimilate: Cherokee, Muscogee, Seminole, Chickasaw, and Choctaw nations, among others, from their homelands to Indian Territory west of the Mississippi River), thousands died. 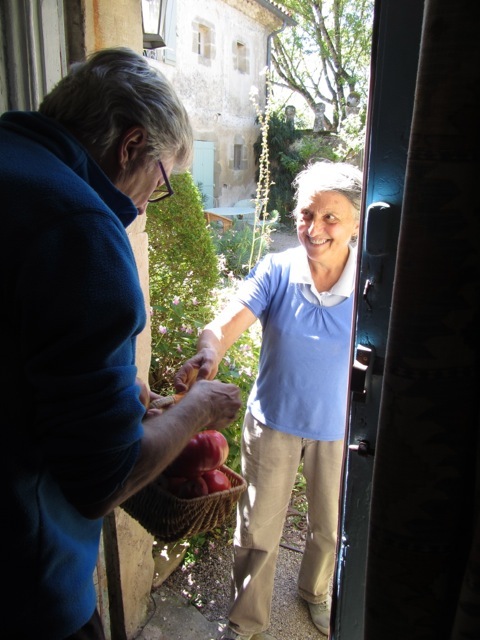 In California vineyards, roses tend to be used instead of these wonderful peaches as an early warning for diseases or pest which might infect the vines and their fruit. One such pest, the Glassy-Winged Sharpshooter, loves to live in Crape Myrtle trees, which are plentiful in CA as street trees and yard ornamentals. That they are still being sold in Wine Country is perplexing to me! Thank you for this–both fascinating and terrible. Good to be reminded of the names of the tribes. You are right about tomato and peach I think. It’s “tomato time” here in the Northeast and we have had a pretty good crop showing up in the farmers markets in NYC this year, but still Meredith’s picture made my mouth water! Enjoy! We have a long narrow garden and the top hundred feet or so is literally a meadow with blackberry,hawthorn and various wildflowers. We would love to keep bees but don’t know anyone who has actually done it. Would you recommend it now that you have done it yourselves ? Yes!–need an expert to guide you though. Meredith adding a reply here: Julie, my neighbor gave me the colony of bees and I had to buy the hive which wasn’t cheap–though I think you can get them second hand. We didn’t launch into it for the honey, but to do our bit to support honey bees, who are vital to our environment and under serious threat. It turns out to be more work than I expected but I enjoy it. Could never manage without my French neighbor taking me on as an apprentice! 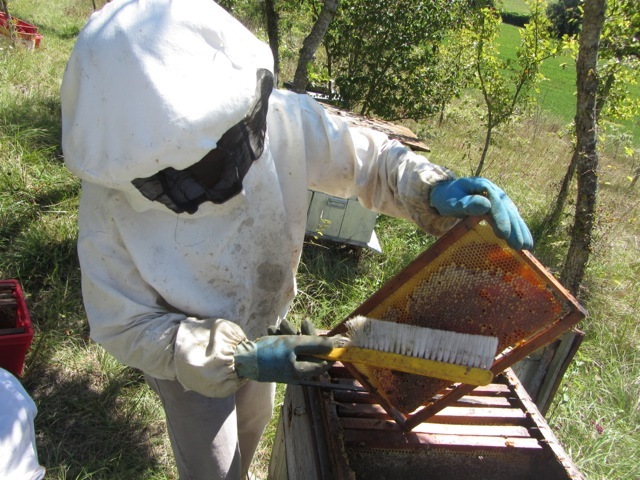 It’s more fun keeping bees with a partner too and when it comes to harvesting the honey, it’s much easier with two people. Our local agricultural college (we live in rural France) runs a FREE course in beekeeping–but so many people attend that I couldn’t cope. Maybe someone near you offers a course as I wouldn’t want to start out without quite a bit of back-up and support. PS That tomato looks like a shrunken beanbag ! Could imagine one of your hedgehogs curled up asleep on there. 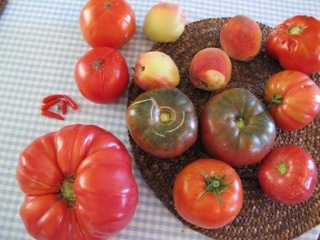 God Bless Alice.. that tomato looks wonderful and so red!!! Thank you for the reply Meredith. 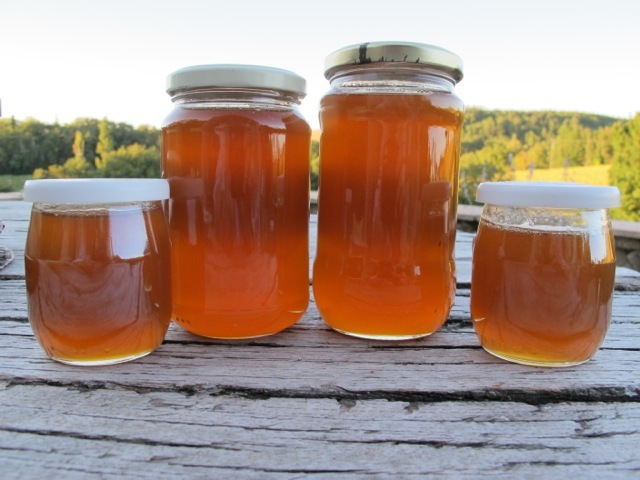 Like you we would like to give a boost to the beleaguered honey bee population ( we have seen far fewer this year ) We will make some enquiries..there is a stall that sells home produced honey at our monthly farmers market so they may be a good place to start. Ironically,two years back, a local bric-a-brac shop was selling a beehive for thirty pounds…I wish we had bought it ! Thank you so much for the advice it is very much appreciated.